The Miluo Tech 16×52 Dual Focus Monocular Telescope was designed to offer clear views up to 1000 yards away. Being a monocular telescope, it is easy to use as all you need to do is point and view. It features a sturdy construction, giving it a long productive life. With up to 16x magnification, you can use the unit for surveillance, hunting, bird and wildlife watching and sightseeing among others. It is designed with a rubber rugged durable armor, keeping it safe from extreme weather conditions. The unit features fully coated optic lenses. This enhances the transmission of light when you are watching. While you can see objects with significant clarity in dim light, you can see nothing in the dark. This makes them ideal for daytime use. This text takes a deeper look into the features of Miluo Tech 16×52 Dual Focus Monocular Telescope. What is Miluo Tech 16×52 Dual Focus Monocular Telescope? This is a monocular telescope. Like other products in its class, the Miluo Tech is compact and lightweight, weighing only 3.2 ounces. 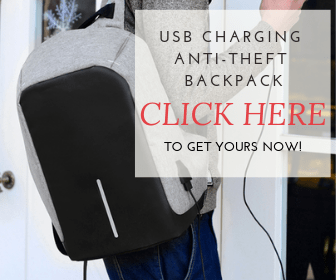 This allows you to carry it anywhere you want in your backpack. It allows one hand operation for great convenience. With 52mm objective lens diameter, the unit delivers top-notch quality images. This Miluo Tech telescope allows you to zoom from the back and from the front. This gives you all the focus you need. While the double coated lens does not allow light in the dark, it is highly durable, giving you value for money. The price of this unit matches its performance. This makes it a favorite for many people. As with other monocular telescopes, the Miluo Tech does not require any assembly. You only need to keep it well maintained. The unit is calibrated, allowing you to adjust magnification as needed for comfortable focus. Its rubber on the optical tube features grooves that let you tune its focus with ease. 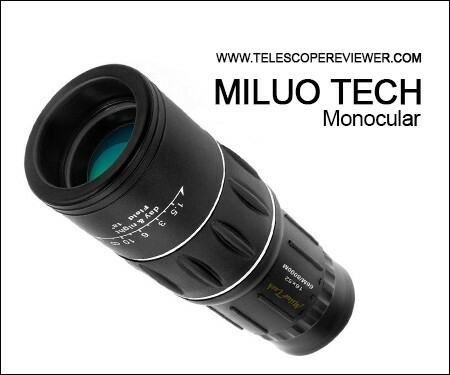 Miluo Tech telescopes can be purchased online from different stores. You can find it on online retail website where it sells for between $12 and $14 for a new piece. You can also buy a used monocular, which retails at as low as $10. Specialty stores also offer this telescope at the same price range. You can buy it from Miluo Tech website. If you need a monocular telescope for sports such as fishing, hunting, camping, hiking and casual surveillance, this unit will offer you great clarity. Its 52mm objective lens allow maximum light transmission for bright images. While the quality and range are still lower than those of professional telescopes, the unit enhances terrestrial viewing. Its lens gives a wide field of view. Its adjustability enhances its performance; adjust the zoom from the back or the front until you get a crisp image and you are good. 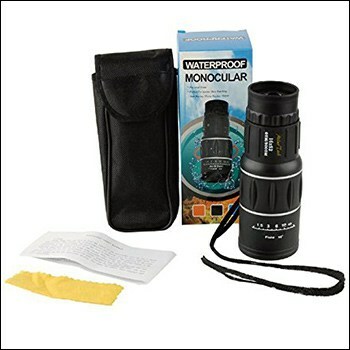 If you love nature, this monocular telescope is a great choice. Users love its ease of use, its relatively high magnification and its sturdiness. You can buy this for personal use or for your children. The Miluo Tech 16×52 Dual Focus Monocular Telescope is offered with a soft lens cloth. When used, this lens does not scratch the lens when you clean. However, just like any other telescope, the lens should not be cleaned frequently to prevent distortion of images seen. Mere dust on the lens can be blown off with an air can. While this unit is strong and durable, care should be taken to keep it safe; away from dust and away from mechanical damage. When cleaning the optical tube, thoroughly remove all dust and dirt from the grooves. These grooves enhance grip for comfortable use. The only way to upgrade this monocular telescope is to buy another one. The lens cannot be removed or replaced when you need a better view. The soft storage case comes in handy when you need to use your equipment outdoors. The manufacturer offers you a one-year warranty with a guarantee of quality. You also get a lifetime of support. According to users, this unit is highly durable and outlives the warranty. Even better, the components of the unit are sturdy, giving it a long productive life. The overall quality of this monocular telescope is commendable. It is designed compact and lightweight. You can carry it on your waist, connected to your belt. When well connected, you will not feel its presence when you walk. With 16x magnification, you will get clear terrestrial object images. Even with its light construction, the unit is still sturdy and strong enough to accommodate extreme sports. While the telescope is waterproof, there are different levels of waterproofness and it should, therefore, not be used in the rain. What was your experience with monocular telescopes? Does the Miluo Tech 16×52 Dual Focus Monocular Telescope meet your needs or will you need better magnification? Share with us.